Thanks to Jay Hinton (“It’s amazing you’re not dead yet”), Dada Pisconti (“The secret life of stem cells”) and James Hartwell (“Plants to save the world”) for their inspiring talks and thanks to our young visitors for coming. A meniscal tear is one of the most common knee injuries, especially in young, active people. Over a million new cases are diagnosed each year in Europe and the US alone, and it also affects professional sportspeople – footballer Luis Suarez, tennis player Roger Federer and Olympic swimmer Sharon Davies are among the many elite athletes to have suffered a meniscal tear. Unfortunately, there is no effective treatment for this injury, but my team and I believe we are one step closer to providing one. Our “living bandage” uses stem cells and collagen to regrow the damaged meniscal cartilage, which acts as a special kind of shock-absorber. Knees are rather wonderful things – first class engineering provided through millennia of evolution. Huge forces are channelled through the knees when we stand up, walk or run, amounting to three to five times our body weight in normal daily use. And they must survive these extreme conditions every day while also giving us the flexibility that we enjoy whenever we move. When they work we don’t really notice them. But if we damage them, we suffer incredible pain and lose the freedom to live a normal, active life. One of the reasons knees work so well is because of the meniscal cartilage, which sits between the bone-ends like stiff cushions. There are two of these menisci in each knee and they are incredibly important for protecting the bones in the joint. If we damage them we are in trouble. However, they can easily tear if we suffer a trauma to the knee and this is a very common type of sporting injury. Most tears will not heal because there is no blood supply and so no chance for natural healing mechanisms to kick in. The standard way to treat them is an operation to remove the damaged part of the meniscus. This works quite well at first, but, in the long-term, our knees don’t do well with only a part of the meniscus. So, with time, there is wear-and-tear of the bone ends and this often leads to premature osteoarthritis. Once the arthritis sets in, it’s a one-way track to chronic pain and ultimately a joint replacement. Because meniscal tears often happen to young athletic people, this can mean many years of disability from arthritis and great cost to the health service. 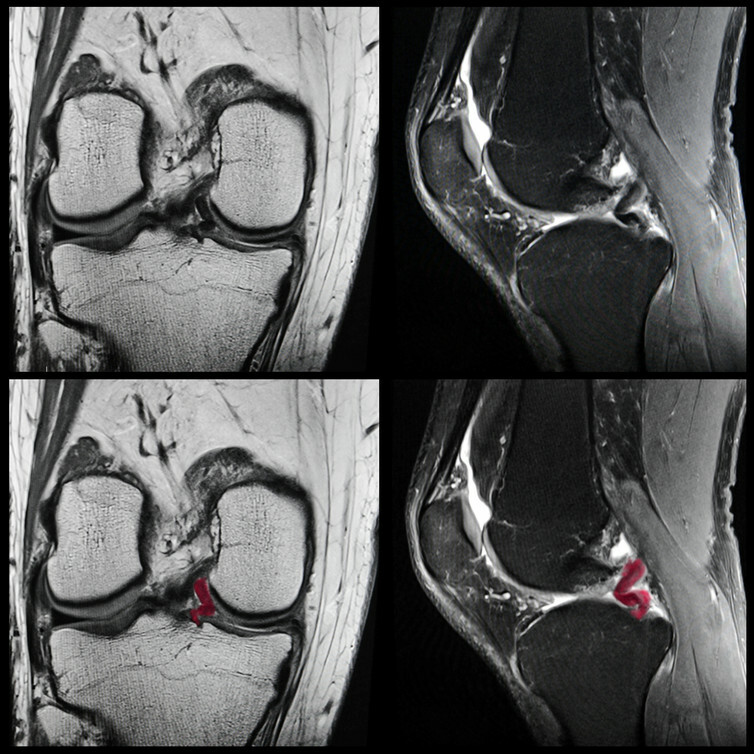 MRI of knee with meniscus injury. My research team began to focus on this problem about 13 years ago. We wanted to deliver living cells with healing properties into the middle of the tear and drive the repair from within. At that time we were studying the biology of a special kind of cell, the mesenchymal stem cell, that is found in small numbers in the bone marrow and which is important for natural healing mechanisms in the body. But simple injection of the stem cells into the tear was not enough because they didn’t end up in the right place. We had to find a way to hold them close to the two injured surfaces of the tear so that they could migrate into the damaged tissue and release their molecular signals for repair. We eventually found a way to do this by placing them in a membrane made from collagen and inserting the stem cell-collagen combination into the tear. Over a few weeks the stem cells migrated into the surrounding meniscus and then the collagen degrades away, allowing healing across the tear boundary. We published our findings, filed a patent to protect our discovery and then set about turning the science into medicine, coming up with a product called the Cell Bandage to test in patients. The first five patients have now been treated and although two of them suffered retear, the other three are all doing fine more than three years later. Although repair of the very outer edge of the meniscus is possible without stem cells because it has a blood supply, most of the meniscus is not repairable and all patients would be expected to re-tear within about a year. So the 60% success rate in this first group of patients to be treated with the Cell Bandage is very encouraging indeed and paves the way for much larger trials in the future. Knees are indeed wonderful things but so too, it seems, are stem cells. 1. Two microscopes displaying samples (from their lab) of muscle progenitor cells fixed at the start (day 0) and end (day 3) of a differentiation experiment where individual cells at the start of the experiment fuse into multinucleated muscle fibers, replicating in vivo muscle formation and regeneration. A laptop was also set up showing a time lapse video of the same process. 2. The Muscle Regeneration game. To show guests the process of muscle regeneration in a more hands-on way, a game was set up here children were asked to repair broken Play-doh ‘muscle fibers’ using Play-doh ‘stem cells’. The aim of the game was to split the stem cell in half, turn one half into a new part of a muscle fiber (ie. A sausage) and fix the broken fiber by ‘fusing’ this new fiber with the broken one. 2-3 sets of broken fibers had to be repaired in this way, with children facing off against siblings/friends/parents to finish in the fastest time possible. They were also assisted on the day by undergraduate students from the University of Liverpool. Find out more about future events here. “Meet the Scientists” is a regular programme of events that takes place at the World Museum Liverpool and organised by the University of Liverpool’s Faculty of Health and Life Science with the support of the Wellcome Trust. On Saturday 26th November the event drew again a large turnout of visitors. The overall theme was “Marvellous Medicines”. It focused on where our medicines come from, the different methods we use to treat diseases as well as the future of modern medicine. The day involved research teams from across the University of Liverpool lending their time and resources to run eight interactive stalls aimed at ensuring a fun and informative day for the whole family, regardless of age. Two stalls out of the eight stemmed from different research teams within the Institute of Integrative Biology. Dr. Raphaël Lévy’s team together with colleagues from the Institute of Translational Medicine (Toni Plagge and his student Joe Robertson) had a stall on “stem cells and nanoparticles”. Dr. Madine’s amyloid group utilised Lego pieces to show how proteins interact with one another and how this impacts their research into neurodegenerative and cardiovascular amyloid diseases. Golden? The beautiful colours of gold nanospheres and nanorods in water. The infrared absorption of some of these nanomaterials can be used to image cells in tissues. The stem cells and nanoparticles stall attempted to translate the ongoing UK Regenerative Medicine Platform work into interactive games to help understand just how small nanoparticles are, as well as showing where stem cells are found within our body and the possible contributions they may be able to have to modern medical science. Dr. Madine’s group used a highly popular tactic among many of the younger visitors. Their game, invented by Kieran Hand and James Torpey, involved using Lego pieces to demonstrate how small molecules can dock to target proteins implicated in the diseases they research. Children were sent on a scavenger hunt around the different stalls to find the hidden complementary shape of Lego that would fit to their existing protein. On their stall, PhD student Kieran Hand said one of their aims was to raise awareness of light chain amyloidosis – a disease that is often left out of the limelight, yet impacts a similar number of people as motor neurone disease. The prizes that had been assembled to give to children who were successful in the drug discovery hunt ran out by 2 pm, showing just how busy the event was. Hammed Badmos also helped on the stall during the day. We’ve got a winner! She found the missing piece! The Meet the Scientists series continues into the new year, with the next event, “Brainiacs”, taking place on the 21st January 2017. It will explore the complexities, faults and cures that surround the human brain.